Plot: An ex-Government Operative must stay on the run until he can clear his name from crime he didn't commit. 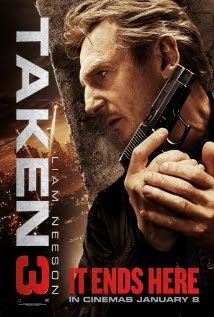 One can only hope that this will be the final installment in the TAKEN franchise. The first film was great, the second was a carbon copy of the first, and while this one actually has a different plot, it has the same feel, action and dialogue as the first two. It does have a couple of interesting twists and turns, but it also has several eye-rolling moments that take away from the excitement of the film. It's tough to be in suspense when you know that no matter how many adversaries the main character is facing, he's still going to be okay. The ending to this trilogy could have been a lot worse than this offering, and for that I guess we should be somewhat thankful, but it is still an average flick at best.